It's been a year since YouTube and the World Economic Forum launched our partnership at the Forum's yearly gathering in Davos. Last year we were asking the 'Davos Question' - "What's one thing that countries, companies, and individuals can do to make the world a better place?" We got answers as varied as the participants in the conference... from Bono to Hamid Karzai to Emma Thompson to Henry Kissinger, world leaders told us about ways to improve the environment, the economy, global cooperation, gender equality, geopolitics, and more. This year, the Forum has a decidedly different feel. The global financial crisis has crystallized the mood here - almost every perspective we've collected is coming through the lens of how the economy in 2009 will present new challenges to all of the major issues we face. That said, this year's theme - the Davos Debates - has brought some very interesting responses to the four main questions we're asking on politics, ethics, the economy, and the environment. Check out the Davos Debates YouTube channel to see playlists of the themes that have emerged, or search for videos from your country or your leaders. 2008 brought a lot of change to the global outlook... one microcosm of that change can be seen in Arthur Mutambara, a young Zimbabwean political leader who we met last year at Davos, just after the Zimbabwean elections has been called. Mutambara uploaded this video, in which he called for free and fair elections so that reigning President Robert Mugabe (also named one of the world's top tyrants on several lists) would have to face the voice of the Zimbabwean people, who'd seen their economy hit record levels of inflation. Unfortunately for Mutambara and his countrymen, the elections that took place were not seen as free nor fair by hardly anyone, and after opposition leaders (Mutambara included) were jailed by Mugabe, international pressure mounted for a power-sharing agreement that would appoint Morgan Tsvangirai as Prime Minister next to President Mugabe. As timing would have it, earlier today that agreement has come to fruition. And Mutambara, a passionate advocate for his country and a compelling speaker, came back to YouTube to upload his reaction. Though many claim the power-sharing agreement won't work and that Mugabe will still rule with the same iron fist, Mutambara's attitude of responsibility and optimism is notable. We need more leaders with this kind of spirit in 2009, as we face down problems that challenge our trust not only in our global economy, but in each other. When world leaders flock to Davos, Switzerland this week to participate in the World Economic Forum's annual meeting, the mood will undoubtedly be more subdued than in previous years. The global financial crisis has left the traditional powerhouses of the event - banks and big business - in a weakened state. As the Wall Street Journal reported this morning, it's now governments who will take a leading role at the Forum, as heads of state from 40 countries examine if and how bailouts and buy-offs can revive their flagging economies, and what other solutions exist. Joining these governments and leaders in Davos this year will be Pablo Camacho of Bogota, Columbia, the winner of YouTube's Davos Debates program in partnership with the World Economic Forum. Along with 250 other YouTube users, Camacho submitted his video answering one of the four key questions posed on the Davos Debates YouTube channel. Camacho decided to answer the question, "Should CEO's have a code of ethics similar to those of doctors and lawyers?" But Pablo's golden ticket to Davos won't be the only avenue for the voice of the people to reach the leaders assembled for WEF. At four different sessions throughout the Forum, clips of YouTube videos submitted by YouTubers will be shown to the leaders assembled there, giving them the chance to hear what people around the world are saying about the future of the global economy. In addition, a YouTube booth at WEF will play videos from YouTube users and ask world leaders for responses - stay tuned to the Davos Debates channel to see the content coming in. YouTube's influence in politics hasn't been just an American phenomenon. Around the world, voters have been using YouTube to speak up on political issues. We've done televised election programming in Spain (youtube.com/elecciones08), the UK (youtube.com/londonmayor08), not to mention Greece and Poland. And now, for the first time in the history of Israel, the public has had the opportunity to submit questions directly to the candidates for Prime Minister - which will be aired in live public forums on Channel 2 news, Israel's most popular news channel. So far, over 250 video questions have been submitted. Now, Israeli citizens get to help determine which quesitons get asked of the three candidates, Tsipi Livni, Benjamin Netanyahu and Ehud Barak. Go to http://www.YouTube.co.il/Elections09 to vote on the questions you think are best. At the end of this week, the winning questions will be announced and would later on be broadcast live on channel 2 News and answered by the candidates. Furthermore, the winners will be invited to the studios to actually attend the candidates' interviews. 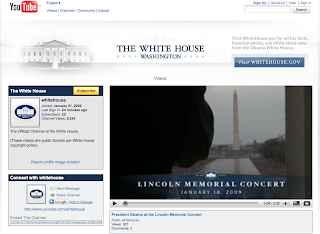 Just after President Obama took the oath of office today, the White House launched a YouTube channel. They're out the door with a few videos from the transition, and will be posting the inauguration ceremony there momentarily. Today, Barack Obama will be inaugurated as the 44th President of the United States. Here at YouTube, we've seen the two-year-long presidential campaign unfold through video -- with hundreds of thousands of videos produced by the campaigns, created by voters, and re-mixed and mashed-up by the community in innumerable ways. Obama inspired people all over the world to take ownership over his campaign with messages of hope and change, and as the first African-American to assume this office, he will make history today when he is sworn in on the steps of the Capitol at noon in Washington, D.C. In honor of the historic nature of today's inauguration, we are dedicating the YouTube homepage to past presidential inaugural addresses. We partnered with C-SPAN to retrieve these speeches from its digital archives. From Franklin Delano Roosevelt's speech during the Great Depression in 1933 to George W. Bush's first inaugural address in 2001, just months before the September 11 attacks, today's homepage provides a comparative view of American presidents on the day each took office. We hope that history geeks, political buffs, and everyday citizens alike will enjoy remembering these remarkable events. If you miss Obama's address at noon Eastern, you can find it here on YouTube soon afterward. The contest may be over, but don't worry -- you can still sign up to volunteer in your area today and post footage of your service experience to YouTube. If you're planning on heading to Washington DC for the Inauguration next week, we suspect (and encourage) you to bring a camera along to document this historic event. But it's critical that you know and understand the heightened security measures being taken on the National Mall so that a) you can film what you want, and b) you don't get your camera taken away from you. The Citizen Media Law Project has put together a useful guide to covering the Inauguration, and we recommend a read-through. It provides basic information about the weekend's festivities and proceedings, as well as a list of where you can go, what you can bring, and what you're allowed to do. Not to mention what you should do if you run into trouble. Today, just three days after the House and Senate announced their official presence on YouTube, Mayor Bloomberg launched his YouTube channel for the New York City Mayor's office. Mayor Bloomberg's channel, which can be found at youtube.com/mayorbloomberg, features a personal welcome to the YouTube channel from Bloomberg himself, as well as a 7 minute profile of New York City that serves as the introduction to the forthcoming "State of the City" video address. In Bloomberg's "welcome" video, he explains that before taking office, he built a business designed to "provide as much information to the consumer as quickly as possible," and that he feels "government should be no different." The only difference is that now, he says, the consumer is you, the tax-payer. The Mayor promises to work hard to make government more open, transparent and accountable, and aims to use his YouTube channel to this end. Welcome Mayor Bloomberg to YouTube and check out his new channel! This video shows that Pelosi is not only cleverly picking up on trends that resonate with the YouTube community to drive traffic to the serious content on her channel, but also using the site to show her constituents a more personal, less serious side of herself. Congress has come to YouTube! Have you ever wondered what your elected representatives actually do in Washington, D.C.? Ever pondered what day-to-day life on Capitol Hill consists of? Do you want to connect with your Senator or Congressman, but don't feel like sitting down to write a letter? Starting today you can do all these things via YouTube. As the 111th Congress kicks into gear, many of your elected leaders are starting their own YouTube channels. They're posting videos direct from their Washington offices, as well as clips of floor speeches and committee hearings alongside additional behind-the-scenes footage from Capitol Hill. And in conjunction with both the House and Senate, we're launching two new platforms that will help you access your Senator and Representatives' YouTube channels: The Senate Hub (youtube.com/senatehub) and The House Hub (youtube.com/househub). So, why are your elected leaders coming to YouTube? The short answer is: you. Your use of YouTube and other online platforms to speak up on political issues and hold your leaders accountable has shown just how powerful this medium can be. You've shown your elected officials that in order to be in contact with you, they need to come to the platforms you use most, and engage with you directly. These YouTube channels have the potential to make Congress more transparent and accessible than ever before - but only if you continue to connect and engage with your government on the site. The House Hub and Senate Hub are the digital equivalents of a backstage pass to your government. Find your Senator and Representative on YouTube and make a connection... and if your elected representative doesn't have a YouTube channel yet, give them a call or an email and encourage them to get started. Robert Gibbs, President-elect Barack Obama's Press Secretary, has posted a YouTube video answering the questions citizens submitted on "Open for Questions". This is the second series of "Open for Questions" that the transition team has done, and this time 103,512 people submitted 76,031 questions and cast 4,713,083 votes. The transition team, in their blog, called this, "just a hint of the willingness of the public to permanently change the way they interact with their government." See below the video from Gibbs. Ed O'Keefe, who writes the Federal Eye blog on washingtonpost.com, started a project several weeks ago called "Ask Your Government" in which he uses the new Google Moderator tool to gather questions from everyday citizens about how the government is run. Ed asked the YouTube community for their questions, and many of you responded. In this first installment of "Ask Your Government," hundreds submitted questions about how exactly the new administration will institute new policies and enact real change. The community voted on which questions they wanted answered, and Ed took the top ranked question to the experts on Capitol Hill. The top question this go-round came in from Katie JS of Los Altos, California. Katie asked: "Which agencies do you think we should eliminate?" Ed answers the question in the following video, in which he interviews Rep. Darrel Issa (R-California) and Chris Edwards, the Director of Tax Policy at the Cato Institute. Have a question for YOUR government? Visit the Federal Eye's Google Moderator page to submit a question for Ed to answer. See below a great find by Reuters (blogged at the NYT's, "The Lede") - a rap written by former Pakistani prime minister Benazir Bhutto's daughter Bakhtawar, expressing grief over her slain mother, on YouTube. The video only has 4,300 views... but definitely worth a look. It's in English. The Israeli Defense Force has wasted no time in using YouTube to fight the war of public opinion over the fighting in Gaza - their YouTube channel has been one of the highest-ranked channels during the past 10 days of the conflict. Venture Beat has an interesting look at how the IFD has been using YouTube and other internet mediums to bypass the media and gain support for their mission. Palestinian groups have also been posting, though on YouTube their support seems to be more user-generated than official. Of course this isn't the first time an Army has used YouTube to show citizens the boots on the ground perspective - the Multi-National force in Iraq has been active on YouTube for almost two years, and the U.S. Military has several YouTube channels.